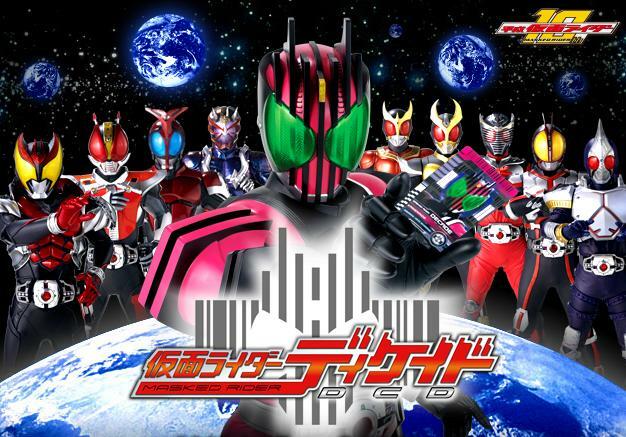 Kamen Rider Decade (仮面ライダーディケイド, Kamen Raidā Dikeido?, Masked Rider DCD) is the title of the 2009 edition of the long-running Kamen Rider Series of tokusatsu dramas. Advertisements in Japanese magazines feature the title character amongst the title characters of the previous nine Heisei Kamen Rider Series, with the secondary riders of each series appearing in recent trailers. Decade, as its title suggests, is the tenth of the Heisei Rider Series, having begun with Kamen Rider Kuuga in 2000. It began broadcast the week following the finale of Kamen Rider Kiva and will be featured in Super Hero Time alongside the 2009 edition of the Super Sentai Series, Samurai Sentai Shinkenger.